Herbert Bratcher, 87 of Horse Cave, passed away Thursday, January 27, at the Caverna Memorial Hospital. The Hart Co. native was the son of the late Lee Bratcher, Sr. and Roberta Brown Bratcher. Mr. Bratcher was a retired farmer and worked for the Horse Cave Tobacco Warehouse #2 for 54 years. He was a member of the Lonoke Baptist Church and a WWII veteran of the U.S. Navy. Mr. Bratcher served as board member for the Hart County Soil Conservation Service for 40years, where he also served as treasurer, he served on the board of directors of Southern States for approximately 30 years and served on the Hart County Public Library Board for 20 years. 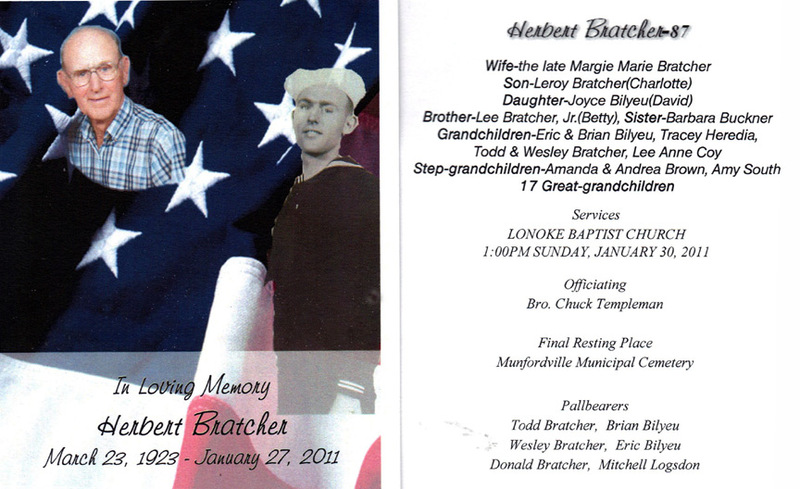 Funeral services for Mr. Herbert Bratcher will be 1pm Sunday at the Lonoke Baptist Church with Bro. Chuck Templeman officiating. Burial will be in the Munfordville Municipal Cemetery. Visitation will be Saturday from 4-8pm and Sunday from 9am-12noon at the Sego Funeral Home. Expressions of sympathy may take the form of donations to the Lonoke Baptist Church Building Fund, donations may be made at the Sego Funeral Home.